Looking for the best flea foggers and flea bombs in 2019? Out of the flea foggers and bombs we reviewed, we really liked the Precor fomula. It contains "S-Methoprene", which is an Insect Growth Regulator (IGR for short), which is an absolutely essential ingredient to eliminating a flea infestation. 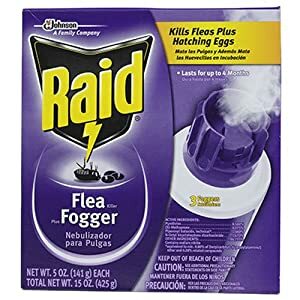 Once released, this fogger will kill the adults and then make the flea eggs infertile so that when they hatch, they can't reproduce, eliminating your infestation. Remember however, using a flea fogger alone is probably not going to completely eliminate your problem. If you have a cat or dog, grab a flea collar to stop them at the source. Use flea sprays in their bedding area and then deploy a flea bomb. See below for additional resources we recommend reading. 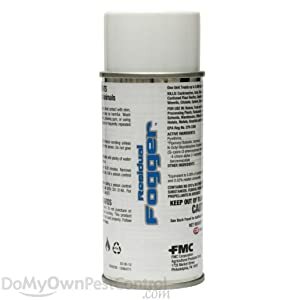 For more information on specifically on fogger use, please continue reading this article. What are flea foggers or flea bombs and where are they used? Where do fleas hide in your house? 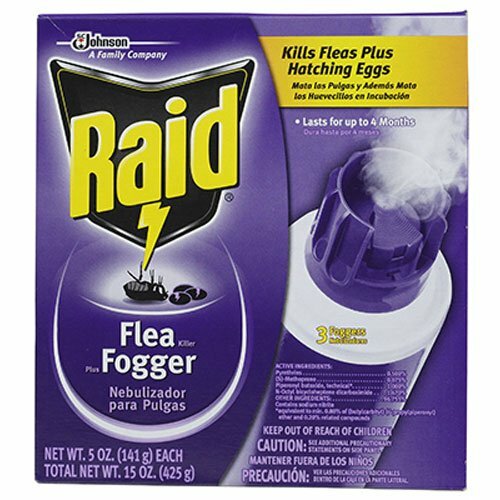 How to use flea foggers and bombs and are they safe? If your pet is scratching and you’ve noticed specs of black in their fur, not only do they have a flea problem, but you most likely have a flea infestation in your house as well. One of the mistakes people commonly make when treating for fleas on their pets is forgetting to treat the areas where their pets live, sleep, and play. This is like giving your baby a bath, but never changing the crib sheets or washing the high chair. It just doesn’t make any sense. You don’t want to clean Spot and Fluffy and have fleas jumping back on them from the carpet or their favorite bed in a few days. If you really want to help your pet and get rid of fleas in your home, you need to invest in quality products. You’ll probably need to have a couple different ones that can work together to eliminate fleas at every stage of their life-cycle, and in every place they might be hiding in your home and on your pet. A comprehensive solution could include flea foggers, otherwise known as flea bombs. To help you out, we've reviewed five of the best flea bombs on the market. Short on time? Check out below our top Flea Foggers and Bombs of 2019. Continue reading if you want to learn more! Flea foggers and bombs are pest control canisters that release an aerosol insecticide and coat everything in a room. This is great because the fog can penetrate some areas that you may not otherwise be able to reach, but it also means you need to take extra precaution in preparing spaces for fogging. The active ingredients in foggers can be tetramethrin, cypermethrin, pyrethrin, etofenprox, permethrin, S-methoprene, and nylar. These last two ingredients are IGR or insect growth regulators. These effectively kill the eggs and larvae of fleas, but not the adults. The other ingredients kill the adults, but not the eggs or larvae. Flea bombs are used in homes, garages, apartments, restaurants, offices, and other enclosures where fleas could be an issue. There are a few ways to determine if you have a flea problem in certain areas. Because fleas don’t care where their next meal comes from (it can be any animal or human), wear white tube socks and notice the areas where fleas jump on them. Or put out pie pans filled with soapy water under a light source like a night light. In the morning, you will see which pie pans have drowned fleas. This can help you determine the best places to put your flea fogger canisters. Each canister provides instructions for determining square footage and how many canisters to use per room. A general rule of thumb is one canister per room, but for small rooms with adjoining doors, one canister may be used. Never overuse flea foggers as too many can cause an explosion if they are near a stove, oven, or pilot light. Definitely not the kind of bomb you have in mind! After fleas mate and eggs are released, some will stick to your dog or cat’s fur, but most of the eggs simply fall off. This means fleas can hide on bedding, in the carpet, on the couch, or wherever your pet frequently visits. Fleas like to hide in cracks and crevices, so you can also have an infestation in wood floors or baseboards. They are also found on socks and pant legs, in shoes, and on items such as throw pillows and bed pillows. Adult female fleas lay about 40 eggs per day, so you can see how quickly an infestation can occur. Eggs in your carpeting or bedding will soon hatch and larvae will emerge. These rice-size tiny worms will then wrap up in cocoons and enter the pupae stage of their life cycle. The pupae stay safely hidden in carpet and fabric fibers while they are protected by the cocoon. The eggs and pupae are the most difficult to destroy with their protective outer coverings. Finally, adult fleas will emerge from the cocoons when they receive signals that a host is nearby. The signals can be vibrations from walking by, carbon dioxide that we give off when we breathe, and body heat. Read Also: How can you tell if your dog has fleas? We’re all just walking dinner bells for hungry fleas! Setting off foggers and bombs takes quite a bit of work and time for them to be effective. The money you save by not call an exterminator is made up in the amount of time and prep work you're going to need to do. This is doable, but you need to pay close attention to the instructions to avoid any health or safety issues. Remember, a flea fogger should be used in conjunction with other flea removal products for the greatest chance of success. For example, if you have a cat, read our guide on the right cat flea collars to stop them from actively reproducing and laying more eggs. Deploy flea sprays in key areas like cuboards, dressers, and closets, then foggers for open areas like floors and baseboards. This is a more "complete" approach that should yield better results. Here's our guide on flea removal if you need more information. If you have babies, toddlers, or children in your home, flea foggers can be safe, but you need to take extra precautions by letting your home air out for at least an hour with the windows open. This should go without saying, but make sure everyone, including children and pets, are out of the house completely before the foggers are set off. Once you return home, you will need to clean everything that has come into contact with the aerosol. This may include clothing, furniture surfaces, children’s toys and mobiles, linens, and anything else a child could touch. There will be residue on these items that you don’t want a child to consume. It is ideal if you can leave the carpets for a few days without cleaning so the insecticide can continue to work, but this isn’t always possible. That’s why the best time to set foggers is when you are going on vacation. Once you return to your home, make sure you open the doors and windows to air out any lingering fog before you come back into the house for good. Here are product reviews of the top five flea foggers and bombs on the market today. This bomb provides double duty with one ingredient to kill adult fleas and another to stop the developing fleas. One canister can treat up to 750 feet and can prevent future fleas for up to 7 full months. The makers suggest vacuuming every other day for 14 days after treatment. 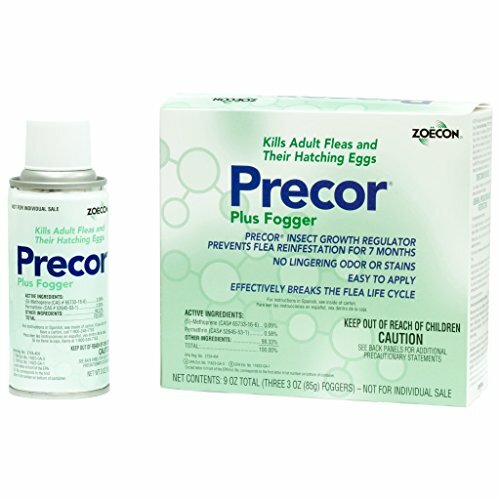 Precor is one of the most recommended brands by veterinarians and pest professionals. 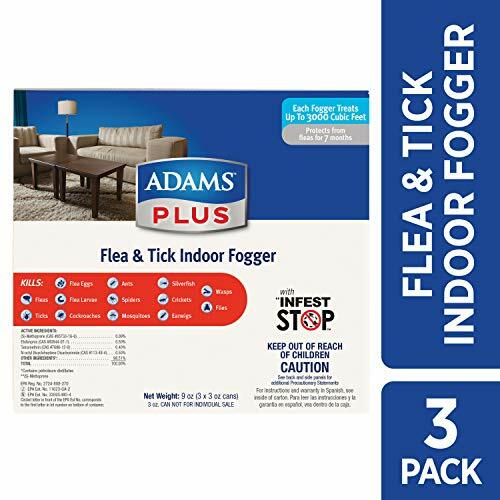 This three-can fogger pack treats carpets, curtains, couches, and other upholstery and is specifically formulated to really get into cracks where fleas hide. The active ingredients are Etofenprox, Tetramethrin, and N-octyl Bicycloheptene Dicarboximide which will kill the adults. Adams also has an IGR, S-Methoprene to kill eggs, larvae, and pupae. The FMC formulation provides a comprehensive pest control solution. In addition to fleas, FMC kills cockroaches, ants, mosquitoes, ticks, and other pests. One canister treats up to 5,000 square feet and it can be used in the kitchen if you cover foods and food contact surfaces. This product should not be used in rooms smaller than 5x5 feet but you can leave doors open for the fog to travel between rooms. The Durvet brand fogger has three insecticides as part of its active ingredients list, so it not only kills fleas, but a whole host of other insects as well. This could make it a great product for places like shelters, barns, or basements where you often have multiple insect issues. If you like the Raid brand, but need something that will kill eggs and larvae in addition to adults, this is the Raid fogger with insect growth regulator (IGR). This product has good reviews for effectiveness and short treatment time, but it can have the strongest odor. It might be a good option if you are able to set the foggers and leave your home for a few days. All of the foggers presented should do a good job of killing the adult fleas. The differences lie in their ability to kill eggs and larvae, and in how long the product remains effective after application. For these reasons, the Precor Plus Flea Fogger has the greatest advantage with four active insecticides for adults and eggs and effectiveness for 7 months after treatment. 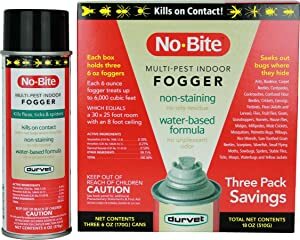 No matter which fogger you select, it is critical that you tackle all angles of your flea problem while you are implementing a fogging treatment. Take your pet to a groomer for a flea dip and take your linens and pet bedding to a laundromat. Wash and dry everything on high heat. You can purchase a flea spray to prevent re-infestation of your pet and consider treating outside areas as well. You and your pets don’t have to be stuck with fleas. Take the steps you can to find relief. At the end of the day we'd still recommend you consult a professional before deploying any insecticides or pesticides in or around your home. We have a handy exterminator search tool that'll help you find someone who's been reviewed highly in your area.